As much as we love the outdoors, it’s important to remember — and respect — that we’re guests in the backcountry, sharing the wild with the animals that call it home. Aside from predators like bears, wolves, mountain lions and alligators, one species you’ll need to be mindful of is snakes, especially venomous ones. Spend enough time hiking in regions where snakes are found and you’re sure to encounter one eventually. Today we’ll look at four tips to prepare you for encountering poisonous snakes on the trail. An important part of reducing your risk of encountering a venomous snake is knowing where they’re likely to be found. Snakes are cold-blooded reptiles, which means you’ll likely see them basking in the sun when the temperatures are cooler, such as early in the morning or in the evening. Give them space and you should be fine. When the sun gets higher, snakes tend to seek cool spots like bushes and beneath rocks or fallen trees. To prevent provoking a bite, look before stepping onto and off fallen trees and rocks to see if a snake is coiled where you’re about to put your feet. 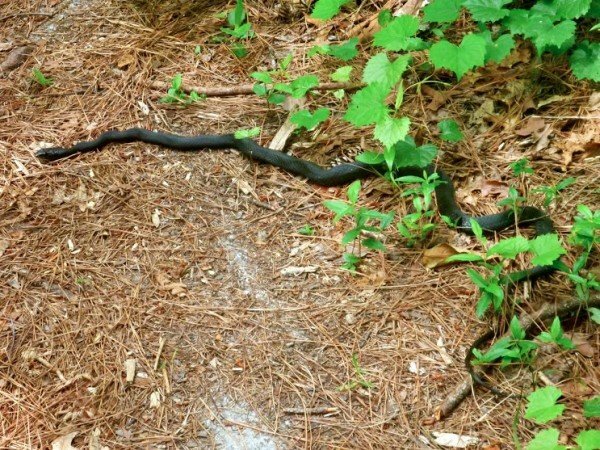 Should you come across a snake on the trail, it may be tempting to try to coax or even move it away from the trail. This is the most common way people suffer snake bites while hiking. It’s easier to walk around the snake so resist the urge to move it and just keep on hiking. Also some hikers aren’t fans of snakes and may even try to kill one they stumble upon. Doing so is not only completely disrespectful of nature, but may also be illegal depending on where you’re hiking. Obviously, if you’re heading into unfamiliar territory, you should always research the area ahead of time. With snakes, this means checking local DNR websites or field guides for the venomous species you may encounter. The United States is home to its fair share of poisonous snakes, including several types of rattlesnakes, water moccasins, copperheads and coral snakes. Bonus Tip: Coral snakes are almost identical to some species of milk snakes and king snakes, so look for red stripes touching yellow stripes to let you know that it’s a coral snake and not an impostor. Umm, It Bit Me…Now What? Sometimes, no matter how careful you are, you’ll still get bit by a snake that’s found its way into your tent for warmth or was resting on the other side of the log you just stepped over. The first—and sometimes hardest, I know—thing to do here is remain calm, as panicking may actually cause the venom to spread more quickly. Next, you’ll want to identify the snake that bit you if possible. This will help if antivenin is needed. Make your way back to your car and head to the nearest hospital right away. Thankfully, the U.S. isn’t home to many deadly snakes, but venomous bites do hurt a ton and can cause long-term damage if untreated.